Have you ever looked up at the full moon and felt a shiver run down your spine? It’s a tingling of excitement. A magick that is wordless and wise. Many of us, myself included, have found ourselves enchanted by Moon magick. I am a true lunar devotee and as part of my Moon magick, I teach a course on the Moon, herbal healing, and personal magick. Learning to make magick by the Moon is one of the easiest, yet most profound ways of re-enchanting your life. I’ve outlined some of the simple ways that you can start making herbal remedies in alignment with the Moon, whether you measure the length of your brewing time by the Moon’s cycles or create specific remedies depending on what sign the Moon is in. Paying attention to lunar cycles is another way that we can practice engaged herbalism that holds simultaneous awareness of both our inner and outer worlds and seeks to work with both to create a harmonious way of healing. Do you have a favorite way of working with the Moon in your remedy-making? Share below in the comments - I would love to read your stories. One of the simplest ways to begin working with the Moon is to measure the length of your brew or infusion by the Moon’s cycle. A full cycle of the Moon is about 29 and a half days. I often let my herbal extracts brew for three full cycles of the Moon, while other herbalists brew their remedies for only one full cycle or from one phase to the next (such as from the Waxing Quarter Moon to the Full Moon). It is up to you how long you let your herbal remedies infuse, but I encourage experimentation! There is an inherently magickal rhythm that occurs when your remedy-making becomes linked up to the cycles of the Moon. It is a very old and ancient humyn practice to do so and feels deeply connecting to our ancestors when we align ourselves with lunar rhythms and imbibe remedies that were brewed with attention to the Moon’s passage in the sky. Another simple way of incorporating some lunar magick into your remedy-making practice is by exposing your remedies to moonlight. I like to sit my jars of brews, whether oils, extracts or teas, to moonlight on a regular basis when they are in the process of infusing or coming together. I’ve infused some lunar oils where I do not allow them to be exposed to sunlight at all, putting them out when the sun goes down and removing them before the sun comes up again. The Moon has an ethereal and powerful energetic quality bringing a unique magick to any brew that it touches. If you want to be a bit more precise in your magick, you can choose to leave your brews under the Moon during a specific phase or sign which will explore below. New Moon :The Sun and Moon are conjunct. It is 0 - 15% waxing and 0 - 4 days from the New Moon. Crescent Moon : The Moon is 45 degrees ahead of the Sun. It is 15 - 50% waxing and 4 - 7 days from the New Moon. Waxing (or First) Quarter Moon : The Moon is 90 degrees from the Sun or square the Sun. It is 50 - 85% waxing and 7 - 11 days from the New Moon. Gibbous Moon : The Moon is 135 degrees from the Sun or a waxing sesqui-square. It is 85% - 100% waxing and 11 - 15 days from the New Moon. Full Moon : The Moon is 180 degrees from the Sun or opposite the Sun. It is 85% - 100% waning and 15 - 19 days from the New Moon. Disseminating Moon : The Moon is 135 degrees from the Sun or a waning sesqui-square. 50 - 85% waning and 19 - 21 days from the New Moon. Waning (or Third) Quarter Moon : The Moon is 90 degrees from the Sun or square the Sun. 50 - 15% waning and 21 - 26 days from the New Moon. Dark (or Balsamic) Moon : The Moon is forty-five degrees behind the Sun or semi-square with the Sun. It is 0 - 15% waning and 26 - 29 days from the New Moon. Most folks work with two phases: the Full Moon and the New Moon. I work predominantly with five phases of the Moon (the Full Moon, the Waning Quarter Moon, the Dark Moon, the New Moon, and the Waxing Quarter Moon), but do work with all eight distinct phases at one point or another throughout the solar year. Each phase of the Moon carries it’s own unique energetic signature and it is worth going out each night during these phases for a complete cycle of the Moon to appreciate the different feel each phase gives off. When I am making remedies, I work with the phases of the Moon to enhance their healing qualities. I might make a remedy that is about pulling toxicity from the body and thinning out build-up of waste during the Waning Quarter Moon. Or an energizing blend for enhancing psychic ability at the Full Moon. I rarely make remedies at the Dark of the Moon, a period of rest for me, but on occasion there is a charm that requires the depth that only the darkest of nights can provide. The following is a short list of correspondences for each phase, including references for when to make remedies to strengthen or diffuse the energies of the six tissue states of Traditional Western Herbalism. New Moon + Crescent Moon : Excellent for most any remedy-making endeavor as the power of the brew will grow with the Moon’s waxing. Stimulating brews, warming bitters, energizing nervines, restoratives, alteratives, remedies for new beginnings, for children, and to jumpstart vitality. Traditionally, a time of hot and moist herbs. Strengthens the Hot/Excitation and Damp/Relaxation tissue states. Alleviates the Cold/Depression and Dry/Atrophy tissue states. Read the full Herbs of the New Moon post. Waxing (or First) Quarter Moon + Gibbous Moon : A good time for brewing daily tonics that are building and nutritive in nature. Traditionally, a time of hot and dry herbs. Strengthens the Hot / Excitation and Dry/Atrophy tissue states. Alleviates the Cold/Depression and Damp/Stagnation tissue states. Full Moon : The Full Moon is an excellent time all-around for making any kind of remedy. The Moon is at the peak of its maturation and power, offering a well-rounded (ha!) energy for your remedy. Traditionally, herbs are cold and dry. Strengthens the Cold/Depression, Dry/Atrophy, and Tense/Constriction tissue states. Alleviates the Hot/Excitation and Damp/Relaxation tissue states. Disseminating + Waning (or Third) Quarter Moon : Grounding and relaxing remedies do well when made during the Disseminating + Waning Quarter Moon. Relaxing nervines, sleep aides, cooling bitters, mucilaginous brews, and remedies that disperse excess energy. Traditionally, a time of cold and moist herbs. Strengthens the Cold/Depression and Damp/Stagnation tissue states. Alleviates the Dry/Atrophy tissue state. Dark Moon : The time for shadow work and going to the depths. As I already mentioned, I rarely make remedies during the dark of the Moon because it is a time of deep rest for me. On rare occasion I make remedies for calling the soul back home to the body when there has been profound loss. The Dark of the Moon embodies herbs of all temperaments: the cold of the grave, the heat of a compost heap, the dryness of old bones, and the moistness of the deepest depths of earth. In addition to the phases of the Moon you may also choose to work with the different signs of the Moon. Each one of the twelve signs of the zodiac offer a unique energetic pattern that you can connect with when making your remedies. A Full Moon in Scorpio, for example, is going to be very different than a Full Moon in Taurus. If you are familiar with the order of the zodiac and know what sign the Sun is in you can figure out what sign the New Moon and Full Moon will be in rather easily. If the Sun is in Aries the New Moon will be in Aries since that is when the Sun and Moon are conjunct and sharing the same sign. The Full Moon, which is opposite the Sun, will be in the sign opposite the current Sun Sign. The Full Moon will be in the sign of Libra is the Sun is in the sign of Aries. The Quarter Moon are found square to the Sun and so will be in the sign square to the Sun sign. So the Sun in Aries will have a Waxing Quarter Moon in Cancer and a Waning Quarter Moon in Capricorn. The Moon moves through the entire zodiac during its 29 and half day cycle, moving through each sign roughly every 2 and a half days. So each month you have an opportunity to work with all signs of the zodiac if you so choose. A nervine brew made during the New Moon in Pisces will carry a different soothing energy than the same brew made during a Waning Quarter Moon in Taurus. Aries: I bring the power of starting. Beginning a project. Being the first. Bravery and courage. The spark to start a new period in your life. Check out the Aries Astroherbology Profile for a full description of the body systems that the Ram guards. Taurus: I bring the power of grounding. Becoming a greenhouse of energy. Steadiness and certainty. Long-term vision and growth. Finding pleasure in the physical form. Check out the Taurus Astroherbology Profile for a full description of the body systems that the Bull guards. Gemini: I bring the power of storytelling. Changing your mind. Telling your story. Clarifying your communication. Check out the Gemini Astroherbology Profile for a full description of the body systems that the Twins guard. Cancer: I bring the power of emoting. Emotional maturity and intelligence. Healing wounds of the past. Finding and knowing security. Check out the Cancer Astroherbology Profile for a full description of the body systems that the Crab guards. Leo: I bring the power of performance. Setting the stage for you to emerge. Being who you truly are in the world. Acting out your dreams. Check out the Leo Astroherbology Profile for a full description of the body systems that the Lion guards. Virgo: I bring the power of service. Creating healing spaces. Being of service to others in their times of need. Making healing choices. Check out the Virgo Astroherbology Profile for a full description of the body systems that the Virgin guards. Libra: I bring the power of beauty. Finding the beauty within and around you. Creating beauty. Harmonizing and balancing. Check out the Libra Astroherbology Profile for a full description of the body systems that the Scales guard. Scorpio: I bring the power of depth. Exploring mystical depths. Developing psychic gifts. Trusting your intuition. Check out the Scorpio Astroherbology Profile for a full description of the body systems that the Scorpion guards. Sagittarius: I bring the power of movement. Going on an adventure. Following your desire. Trusting your inner compass to guide you home. Check out the Sagittarius Astroherbology Profile for a full description of the body systems that the Archer guards. Capricorn: I bring the power of structure. Creating structures and foundations. Organizing disparate pieces of your life. Allowing space for revolutionary change of outmoded models and ways of being. Check out the Capricorn Astroherbology Profile for a full description of the body systems that the Goatfish guards. Aquarius: I bring the power of innovation. Inspiring change. Seeking new ways of being. Embracing eccentricity without losing sight of one’s roots. Check out the Aquarius Astroherbology Profile for a full description of the body systems that the Waterbearer guards. Pisces: I bring the power of empathy. Blurring boundaries. Cultivating connections. Knowing yourself and others on a profound soul level. Check out the Pisces Astroherbology Profile for a full description of the body systems that the Fish guards. 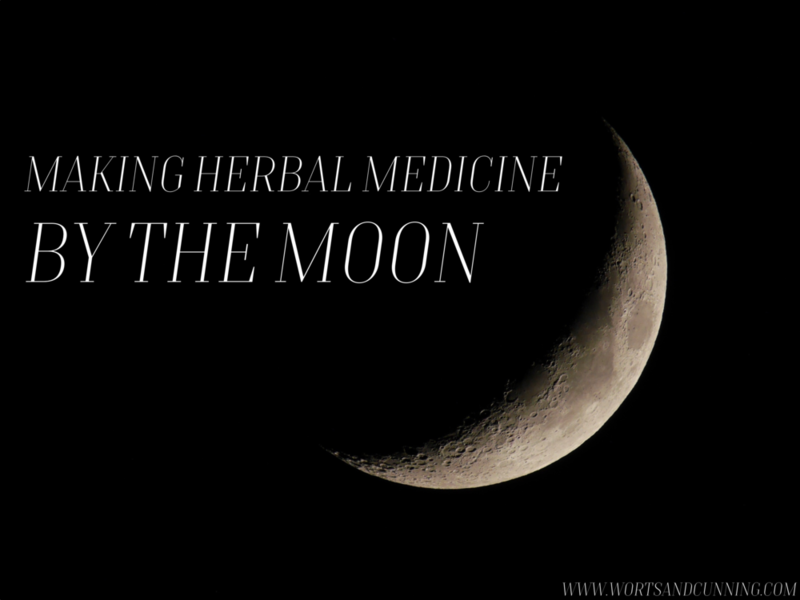 These are only a few ways to work with the Moon when making herbal remedies. I also work with (and teach others how to do the same!) the 28 Mansions of the Moon when creating herbal remedies as well as creating natal Moon and progressed Moon remedies. We explore all of this and more in the Lunar Apothecary, my in-depth and in-expensive year-long ecourse and private online community for those ready to learn more about their own wisdom and the art of herbal medicine and magick. It is not only through herbal arts that we can connect with the magick of the Moon. Another one of my favorite ways of working with the Moon is project planning and implementation. Check out Moonpath to learn more. The Moon is a shapeshifter, teaching us how to shift and change in our own lives, and working with them allows us to become more expansive and open to the possibility of what if and what might become. May your Moon magick endeavors be successful and full of enchantment. I hope you are inspired as I am to work with the plants and the stars, moons, and planets which populate our galactic home. We respect your privacy and will not share your information with anyone during any phase of the Moon.